This PDF 1.2 document has been generated by pdfFactory www.pdffactory.com / pdfFactory 1.65 (Windows XP Home), and has been sent on pdf-archive.com on 16/01/2015 at 21:09, from IP address 87.112.x.x. The current document download page has been viewed 1556 times. File size: 144 KB (8 pages). on reform of its public library service. assess people’s response to the consultation booklet and the questionnaire. explain their reactions to the questionnaire as they attempted to complete it. attempted to fill in the questionnaire. hours to try and understand and respond to the questionnaire. proved better suited to the time demands demanded by the consultation process. perceive the Council’s plans to be flawed. propositions with which they do not agree. 3. Reaction to the Consultation Booklet. 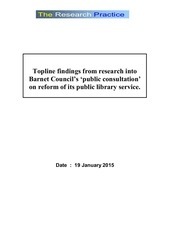 The consultation booklet proposed three options for reconfiguring the library service. document provided no information on this. evidence that fully-automated public libraries are a success. “Have you tried to use those machines for bringing things back and borrowing? libraries than all the other alternative ways of running the library service. way and without careful consideration. arbitrary way and without any consideration or care. consultation and deter public response. lockers’, ‘staff owned mutual’, ‘Barnet Libraries Supporter Scheme’, etc). necessary background information to aid completion of the questionnaire. found it longwinded and confusingly constructed. hardly any of the questions were straight-forward or made sense to respondents. report some general themes that emerged as people tried to fill in the questionnaire. Some questions seemed so bland that they did not seem to be worth asking. library usage patterns, and perhaps insights into consumer behaviour and attitudes. in terms of cost, viability, or likely impact on users of the service. it was impossible to weigh up what one was being asked. “I filled it in as carefully as I could and it took an age because I wanted to submit it. current proposals and consultation seem unfit for the purpose. would be keen to adopt a reform process which is straight-forward and transparent. This file has been shared by a user of PDF Archive. Document ID: 00204233.